Eighteen months ago I joined the future and bought a shiny slab of technology, a 2012 WiFi Nexus 7. Since then many newer and shinier models have appeared on the market, so a long detailed review is less interesting than looking at the useful niche it has found in my everyday life: replacing paper. Still, for the curious, here’s the short opinion on the Nexus 7 itself: very nice screen, good battery life and a solid feel. Other than the screen I don't have any physical comments to make as a few days after I bought it I put it in a Smart Cover derivative case that it has never left since and works a treat. That it wakes when you open the cover is a very nice touch. Sadly over the last eighteen months it has slowed down noticeably. Switching between open apps, rotating, keyboard appearing etc. all now come with irritating delays. Once you're in the app, or typing it's ok, and it seems to still handle the apps I use without a problem, but transitions are becoming frustratingly sluggish, even with only a couple of apps open at the same time. But these are incidental details, the real revolution is that the combination of Evernote, Pocket, Google Calendar, RSS reader, web browser, Kindle and local storage on one easily transportable device mean that I almost never use paper anymore. No notebook, no appointment diary, no magazines, no books, no printouts. A lot of these are cloud services (or ‘on a remote server’ as it used to be called) that the tablet taps into, but having a local offline copy when you’re not connected to the internet is really what makes it powerful and practical for everyday as you’re not dependent on the vagaries of network coverage. Google Calendar and GMail work fine for organising my life, and sharing calendars with your significant other is the way forward. Having that information easily to hand, and offline, makes it very convenient to know when you can plan things, cutting short a lot of the checking loops you normally have to do plus you don’t forget anything if you put it straight into the calendar when you think of it. The number of books I’ve read in the last year and a half has dropped off noticeably as I've been substituting them with longer articles found online that I can now read easily when travelling, commuting or sitting at home. An RSS reader (I’ve found GReader Pro very good) combined with the Longform.org feed and Pocket, plus a few other RSS feeds creates a ready stream of good quality material. For books there’s mostly Kindle, plus the book-like way you can hold and read the tablet makes it a lot nicer for reading many internet articles than a laptop. 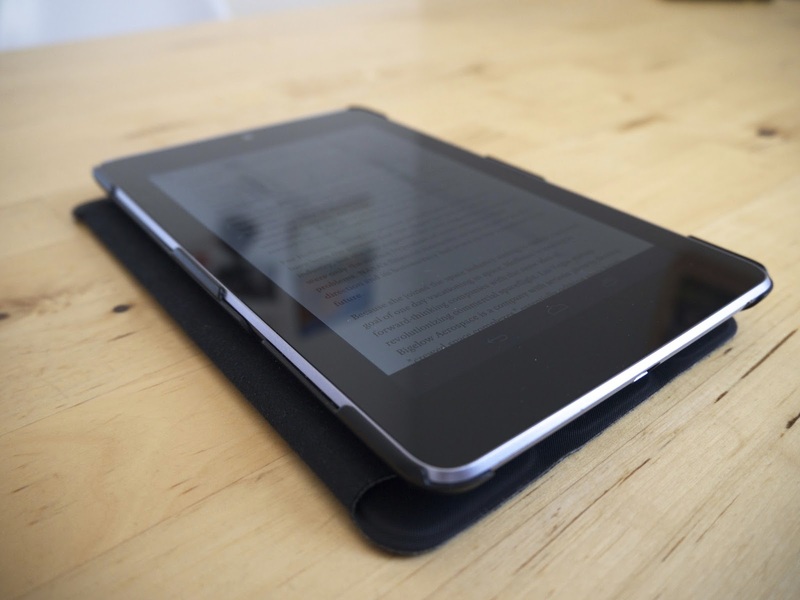 That’s where the tablet as a different kind of device has really made an impact, by changing my behaviour as reading longer internet based pieces has become much easier and more flexible. The biggest surprise was Evernote, which I tried purely because it is also available, unlike Google’s ecosystem, on my Windows Phone. Now I find Evernote indispensable. The web clipping feature is brilliant, allowing you to quickly copy and paste useful info (often timetables or travel information) together into a note and not have to worry about the painful process of re-formatting everything into something legible. I also use it to write blog posts, manage to-dos and anything that I want to remember, short or long term. A shared notebook was fantastic for managing all the things that needed to be done when moving countries and jobs last year. For the offline features and the amount I use it I think Premium is well worth the price. While all these abilities are very useful, they are just the tawdry twentieth century uses for a twenty-first century device; a substitute for something I was already doing, but that's mostly what I use it for. I've played a few games on it, but most of the none-reading or writing time is spent watching DVDs I've ripped. It's a great option when you're too tired or spaced out and just want to sit back and do nothing, especially on planes, trains or busses. It also makes you independent of the vagaries of in-flight entertainment systems. Here Android’s ability to copy and paste the files onto the tablet as a mass-storage device from a NAS, and not deal with library management etc. makes life very easy. It also has a few other regular uses; as a Spotify player to share the music to a bluetooth radio in the kitchen and to broadcast to a Chromecast plugged into the TV from the sofa. Strange to think that your entertainment system is powered by the thing you’re using as the remote. The biggest problem with a 7” screen is that using the onscreen keyboard for anything but short notes is difficult, plus it takes up a lot of the screen space. 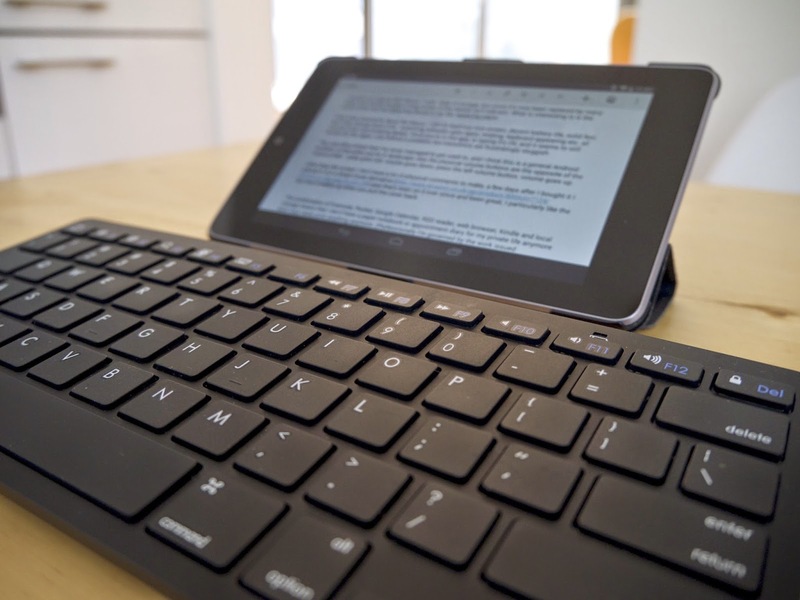 Last year I was deliberating between a Chromebook and tablet, really because of the keyboard. The obvious solution was the to buy a bluetooth keyboard, which I can take with me when I want to write longer notes or e-mails. This is probably the best solution because I can then still use the tablet as an easy to hold and carry reading device without hauling the keyboard along with it. As it’s getting older and slower I’m beginning to think about what next. The 7" size means it will fit almost anywhere, so it never gets left behind and can really be a paper notebook replacement, but I do sometimes wish it had a bigger screen, and that will be the trickiest decision when looking for a successor.